Holy Grail: The T206 Honus Wagner from Barnicle Brothers on Vimeo. 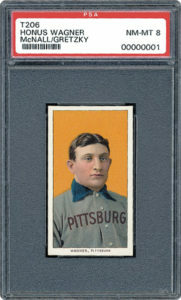 This particular T206 Honus Wagner is the first card ever graded by Professional Sports Authenticator (PSA). It was originally sold in 1991 through Sotheby's and purchased by then Los Angeles Kings Owner, Bruce McNall, who went halfsies on it with Hockey legend, Wayne Gretzky. This combined effort effectively bestowed the card with the designation of The McNall/Gretzky Wagner. The card, in any condition, has been covered extensively by leading hobby news sources and general news outlets. Each time an example is sold, it makes headlines somewhere. I've been lucky enough to have seen many different examples of this card in person and what a magnificent treat it is. Once you know the background of the card, you know you're experiencing something truly special. If you'd like to learn quite a bit more about the card and its fascinating history, I encourage you to read The Card: Collectors, Con Men, and the True Story of History's Most Desired Baseball Card . I read this excellent book back in 2012 and finished it in just a few days. It's that good! The book talks about how Mastro obtained the card, and the insider, near secretive manner in which he's believed to have handled it. It goes on to describe how it's changed hands over the years and who has owned it. Other essential details are covered, including an interesting history of Honus Wagner himself. It's one of my all-time favorite books and a must read for sports collectible enthusiasts, particularly baseball card collectors. Get it here .